Home » Blog » Frequency inverters » How is frequency inverter saving energy? 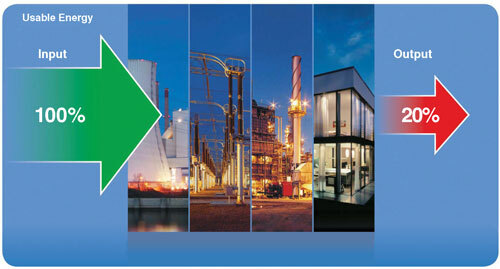 This studies show that up to 80 percent of the energy from the power source to the industrial consumer can be lost. Energy conversion—converting energy into useful work via motors, heat exchangers, process heaters, pumps, motors, fans, compressors, and so forth—represents a large opportunity for energy savings in manufacturing. 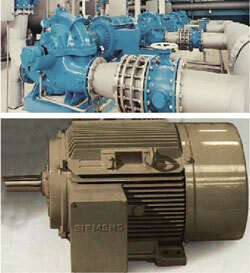 Industrial electric motor-driven systems represent the largest single category of electricity use in China. The industrial sector consumes approximately one-third of the energy used in China (see Fig. 1). Studies show that up to 80 percent of the energy from the power source to the industrial consumer is lost through the transition of raw material to the point of useful output—much of that at the point of conversion from electrical to mechanical output (see Fig. 2). Rising energy costs, a sense of environmental responsibility, government regulation, and a need for energy reliability are driving efforts for energy efficiency in manufacturing. The third area, energy conversion—converting energy into useful work via motors, heat exchangers, process heaters, pumps, motors, fans, compressors, and so forth—represents a large opportunity for energy savings in manufacturing. Industrial electric motor-driven systems represent the largest single category of electricity use in the China—more than 65 percent of power demand in industry. 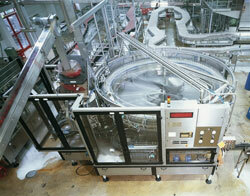 Consequently, motor-driven systems offer the highest energy savings potential in the industrial segment. Supporting this statistic, studies show that 97 to 99 percent of motor life cycle costs are expended on the energy that the motor uses. This fact alone should be a driving motivation for companies to perform a periodic energy consumption analysis on the motor systems they use in their facilities. An inverter is an effective tool in conserving and recovering energy in motor systems. What Is a frequency inverter? Why Use It? A frequency inverter controls AC motor speed (see Fig. 3). The frequency inverter converts the fixed supply frequency (60 Hz) to a variable-frequency, variable-voltage output to enable precise motor speed control. Many frequency inverters even have the potential to return energy to the power grid through their regenerative capability. Reduced mechanical wear and precise control produces more accurate products. Lower consumption lowers carbon emissions and helps reduce negative impact on the environment. Lower consumption qualifies for tax incentives, utility rebates, and, with some companies, energy savings finance programs, which shorten the return on investment (ROI). In many cases, the monthly installment payments on an energy efficiency based loan can be managed via the company's maintenance budget. Pumps, fans, blowers, and compressors using mechanical flow control are excellent applications for frequency inverters (see Fig. 4). Up to 40 percent of all electricity used in industry today is consumed by pump and fan systems. This fact makes them, as well as other flow control systems,prime targets for energy-efficient frequency inverter installations. The flow of air, liquid, or gas traditionally is controlled by using valves, throttles, dampers, louvers, vanes, or other mechanical devices. Restricting or reducing the flow with mechanical devices means that the motor supporting the system runs at 100 percent speed even though 100 percent flow is not required. The result is obvious—wasted energy. What's more, not only is energy wasted, but mechanical flow control can cause undue stress and high temperatures on system components, resulting in premature system failure. Laws of Affinity: The Basis of Savings. The affinity laws are used in hydraulics to express the mathematical relationship between the several variables such as head (pressure), volumetric flow rate, speed, and power involved in pump and fan performance. Flow is proportional to shaft speed. Head (pressure) is proportional to the square of shaft speed. Power is proportional to the cube of shaft speed. Cyclical Applications. In this context, cyclical refers to applications in which the machine comprises of a large inertial load (for example, centrifuges, and punch presses with large flywheels, see Fig. 5). These mechanisms are required to coast to a certain speed or return to a set state. While coasting or returning to the set state, a large amount of inertial energy generated is simply wasted. With a regenerative frequency inverter, this energy can be recovered and returned to the facility power grid for use in other areas. Braking Applications. Braking here refers to electrical braking, more commonly referred to as dynamic braking. These types of applications are known as holding torque applications. As the word braking implies, the load is either slowed down to maintain a certain speed or it is completely stopped (see Fig. 6). 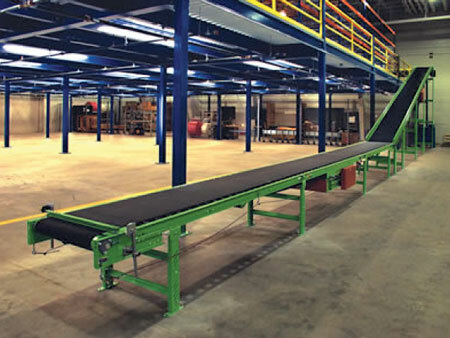 For example, in the mining industry, downhill conveyors must have some method of maintaining their speed, for obvious reasons. An escalator is a similar type of application. As energy is generated from slowing down or stopping the load, it must be dissipated somehow or the frequency inverter will be damaged and all control will be lost. Typically, this is done with a braking chopper (part of the frequency inverter) and a large bank of resistors. As might be expected, the bank of resistors simply is a way to dissipate the energy but it is wasted in the form of heat. Essentially, the bank of resistors is a huge electric heater. However, with a regenerative frequency inverter, this energy can be captured and returned back to the facility power grid for use in other areas. In addition, the bank of resistors is no longer needed. In some cases, the method of braking needs to be cooled as well. This is typically handled via a cooling system using pumps and cooling towers.. Using frequency inverters completely eliminates the need for a cooling system that would be required in those types of applications. Several barriers exist to implementing energy-efficiency programs. These include a reluctance to change a working process, shortage of capital, and the perception that the payback period is too long. Too, unless all parties in the supply chain are motivated and the program has management support, success can be elusive. Studying the success stories of other manufacturers can help overcome these obstacles. In addition, government incentives, utility rebates, and savings-based financing can help translate to a low upfront investment and ROI in as few as three to six months. Awesome blog you guys have! great job on explaining all these electrical principles. Basic Insulation Level (BIL) determined? Diesel Generator(existing) + solar PV(proposed) + grid supply. HOW TO DESIGN EARTHING AND LIGHTNING SYSTEMS IN BUILDINGS?